We got the POWER! Pro iBeacons with 150 M range and 5 years of juice. Beaconic is more than iBeacon hardware. Its the out-of-the-box experience with 2 year support. It will save you a lot of time! Software, hardware, frameworks, support. We got you covered..
Beaconic enables the use of iBeacon technology for all company’s in the EU & US. With our platform its possible to connect to new customers and reward existing customers. We bring your in-store shoppers or audience even closer to your company with our beacon campaign manager. Beaconic takes the Out-of-box experience to the next level for beacon technology. With our endless possibilities like our framework, app, beacon manager and API’s we offer a range of ways to connect. When you receive the beacons you can start adding campaigns to them with just a few clicks. Our Beaconic Retail Kit can be used for unlimited amount of possibilities. Use it for shops, museums, festivals or public spaces with its own specific information or reward. You can add any type of information to the iBeacon like offers or countdown rewards with our Beacon Manager. We like to go further than just delivering your iBeacons and software! Next to our easy to use beacon/campaign manager and our frameworks and apps. You will also get FREE support for 2 years on every Retail Kit order. If you encounter any problems with our hardware we’ll solve it quick and we LOVE feedback about our software package. Hardware and framework updates are also FREE. Our BLE 4.0 Smart Bluetooth™ with their specially developed ARM processors is the most stable iBeacon currently available. The battery of a beacon will live for an estimated 2 years and after setup you don’t have to go trough any kind of technical procedures on hardware and software side. From that moment you can manage their information signal with our CLOUD software for adding offers and rewards and setting up range and frequency. Our Beaconic iBeacon has a built-in Bluetooth ® 4.0 chip. This iBeacon works for the entire license period purchased from our webshop. Our iBeacons are equipped with reusable 3M ® stickers for easy placement. When activated our iBeacons transmit 2.4 GHz Bluetooth ® signals. These signals communicate with smartphones as close as four inches away from a iBeacon to a maximum range of 200 meters. Through our framework and the implementation of Apple iBeacon ® software users will receive notifications when entering their range (iOS 7). With just a few clicks you add the iBeacons to our manager and you’re ready to add campaigns or information ..
Our goals is to make our platform available for every type of company and general users. 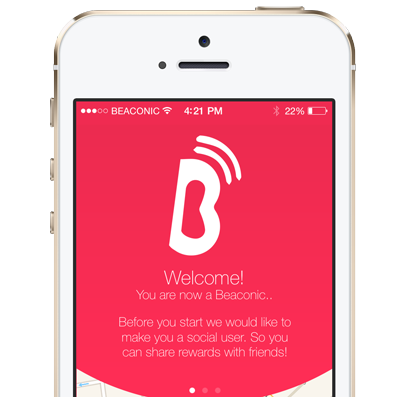 Next to our possibilities to add iBeacons in your application, we also developed our own Beaconic app. This application will search for all rewarding beacons within our platform and will introduce the micro-location technology to everyone. If your campaign is any type of offer or reward you can add your location to our app and attract a new bargain-hunters audience to your space. With Beaconic we won’t obligate you to publish your own application and you can promote your iBeacons with the Beaconic stickers added to our Retail Kit. iBeacon technology will completely revolutionize the retail experience. Your phone will know what you like, and direct you to where those things are. It’s a step closer to our gear existing in a truly intelligent ecosystem. More exciting, though, are standalone iBeacons: low-cost gizmos that continually beam out a Bluetooth signal, running for up to a year on a small watch battery.